Robespierre would give a speech to the Convention where he claimed he had a list of people that were in the Convention that were part of a conspiracy against the revolution, but would refuse to give the names when asked for them. Everyone knew that they could be the one on that list, since the people who were executed were often innocent of any real wrongdoing. The next day he would be arrested by his colleagues, and he and his allies were considered to be outlaws by the military. The reason for claiming that they were outlaws was a legal decision made so that he could be executed without trial as outlaws. 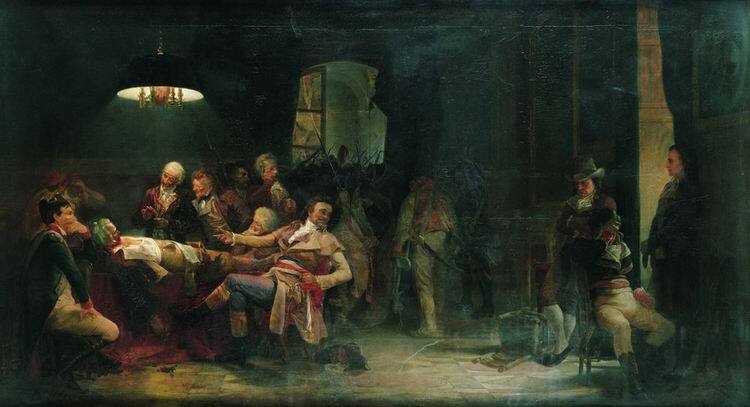 Many of his men tried to kill themselves as the men came to get them, and Robespierre himself would shoot himself trying to do the same (although some people claim he was shot in the arrest). That theory is helped by the fact that the bullet would shatter his lower jaw and make it impossible to defend himself against his accusers. He was guillotined without trial with 19 of his friends and buried in a common cemetery in an unmarked grave (July 28, 1794). The execution of Robespierre would trigger a massive reaction against the radical leaders of the Reign of Terror called the Thermidorian Reaction or the White Terror. In this reaction, the Jacobin leaders of the Reign of Terror would be imprisoned and executed in a mass push for revenge by the Girondists. Most were executed without trial but there were a few leaders who were able to flee to South America before they could be arrested. The people would be willing to deal with this because of their hatred of the price controls of food and theft of farmers to feed Paris. The Girondists who committed these executions would create their own government which was less rigid than before. They would give more individual liberty to the regular people, especially when it comes to religion, but they were absolutely terrible with the economy. Their economic policies led to major inflation that hurt the economy even more than the previous regime.